The 22nd Annual Conference of the International Environment Forum will be a virtual conference of contributions to the United Nations High Level Political Forum in New York on 9-18 July 2018. We hope to co-sponsor or organize events in New York, probably around 12-13 July, but given the intense competition for limited available meeting rooms, we feel we can have more impact by proposing on-line materials on the forum themes that forum participants can view on their smart phones or tablets. We are still looking for IEF members who would volunteer to help write IEF statements on the HLPF themes (see the February Leaves), and/or would record short (ca. 5-10 minutes) videos on those themes that participants could watch on their smart phones or tablets (write ief@iefworld.org). IEF Governing Board member and General Secretary Emily Firth of Australia resigned from the board early this year for family reasons (two small children), and, in a by-election, Christine Muller of Rhode Island USA was elected to the board to replace her. Christine has been an IEF member for many years and has taken the lead in developing our courses on climate change. She will be a wonderful addition to the board. Emily will continue to be an active member in other ways compatible with her family and professional responsibilities. The next regular election of the board will take place at the Annual General Assembly in July. The IEF board has decided to hold the International Environment Forum 23rd Annual Conference and General Assembly in New Zealand in partnership with the 23rd World Conference on Health Promotion, 7-11 April 2019 in Rotorua, hosted by the Health Promotion Forum of New Zealand (HPF) in association with the International Union for Health Promotion and Education (IUHPE) (http://www.iuhpe2019.com/). 3,000 participants are expected for the conference. The theme of the conference is Waiora: Promoting Planetary Health and Sustainable Development. It is based on the traditional Maori concept of ‘Waiora’. Maori are the Indigenous peoples of Aotearoa New Zealand. Translated literally as ‘healing and healthy waters’, Waiora refers to the interconnectedness of our physical and spiritual worlds with our environment. As a theme, Waiora reflects the dependence of our own health on that of our planet, and recognises the major global challenge of balancing ongoing development with environmental stewardship. IEF will be associated with the 'spiritual health promotion’ sub-plenary and will also organize its own session. A call for abstracts for the main conference will be issued soon. IEF members can register their interest on the conference website in order to receive updates on the conference: http://www.iuhpe2019.com/. If any IEF members would like to help with reviewing abstracts, please contact ief@iefworld.org. • Are you confused about the many aspects of climate change and would like to understand the basics? • Do you already know much about climate change and would like to learn about how the Baha'i teachings relate to this issue? • Are you concerned about climate change and want to share your thoughts with others who are similarly concerned? • Do you want to be of service to humankind by helping spread awareness, knowledge, and motivation for action about climate change? The Wilmette Institute course on climate change is here to address all these needs and others. The Universal House of Justice affirms, in a November 29, 2017 letter, that climate change is a vital issue “with profound implications for the common good," upholds the importance of science, and expresses its hope that Baha'is will "continually grow in their capacity to make a distinctive and effective contribution to addressing the multitudinous problems afflicting society and the planet, including those associated with climate change." This course on Climate Change will provide a basic understanding of the causes and impacts of climate change, discuss its ethical challenges, and relate them to the spiritual teachings of the world's religions, particularly those of the Baha'i Faith. It will help you consider changes in your lifestyle to bring greater coherence to your life and show you how to incorporate environmental and social responsibility in Baha'i core activities and community gatherings. It will also assist you to elevate public discourse above partisan politics by introducing spiritual responses to the climate crisis. The course, which is open to people of all, or no, religious backgrounds, includes many optional resources for those who wish to delve more deeply into climate-change issues. The participants of this online course come from many countries and cultures. Although the course is online, it's not impersonal; the number of participants are relatively small,l and all active participants get to know each other well. On behalf of the Centre for Collaborative Learning for Sustainable Development at Inland Norway University of Applied Sciences and the Director of the Centre, Victoria Thoresen, we would like to invite you to a workshop on Education for Sustainable Living: Advancing teaching and learning for responsible consumption. The workshop will examine how education can support progress towards SDG 12, and it will consider how policy, pedagogy and practice of education for sustainable living and responsible consumption may best be advanced especially in the Latin America region. This workshop aims to share experiences with education for sustainable living and examples of best practice from around the world. It will focus on how to improve both teacher training and educational practice in schools on sustainable living and responsible consumption. Inland Norway University of Applied Sciences Høgskolen i Innlandet, Hamar, Norway. 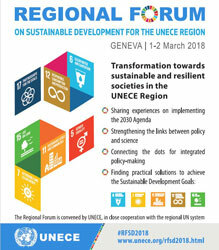 On 1-2 March, the UN Economic Commission for Europe (UNECE) held a Regional Forum on Sustainable Development in Geneva, Switzerland, to prepare for the High Level Political Forum (HLPF) next July in New York. This was the first of similar forums planned for each of the UN Regional Commissions. Almost all the governments of the region sent high-level delegations, many headed by government Ministers. The day before, representatives of civil society organizations and other stakeholders, including the International Environment Forum, held a pre-meeting to agree on key points to be raised with governments. The Forum was opened by the President of the UN Economic and Social Council, the Deputy Secretary-General of the United Nations, the Executive Secretary of UNECE, and the Chair of the UN Development Group Team for the region, all women, as the UN has achieved gender balance in its high-level positions. In a High-level Policy Segment, Professor Peter Messerli of the University of Bern, Co-Chair of the UN Global Sustainable Development Report, presented a review of progress and challenges in implementing the Sustainable Development Goals. He highlighted some of the major challenges, including this critical decade to abandon fossil fuels and avoid a climate catastrophe, growing inequality with 1% of the world population owning half the world's wealth and half the population having 2.4%, and political efforts to reverse globalization and end multilateral engagement. On the other hand, the adoption of the Sustainable Development Goals and the Paris Climate Agreement provide a positive narrative for globalization, but not a users guide for transformation. Instead of the earlier linear vision of sustainable development along three pillars, we now know that the challenges are indivisible and will require hard choices, requiring intentional policies, universal effort and time-bound actions. He cited a recent paper (O'Neill et al. 2018) on a good life for all within planetary boundaries, combining biophysical boundaries and social thresholds, that showed that no country today is both environmentally and socially sustainable. High consumption improves social indicators but is bad for the environment, while some poor countries use only their share of natural resources but fail to meet the needs of their population, and many do poorly on both counts, being both environmental and social failures. All countries must move, but in different directions, and all are linked in a single global system faced with a very real danger of collapse. The Sustainable Development Goals indicate the way forward, but there are synergies and conflicts between goals that must be addressed together across silos and at multiple levels. To move ahead, we need both the factual certainty of science and high societal agreement. The Global Sustainable Development Report (UN 2016, next due in 2019) tries to support this. This requires contextualized and balanced perspectives and knowledge for policy transformation, but in the present world, knowledge is highly unequally distributed. Agenda 2030 gives us a vision for humanity in the Anthropocene, but we need transformations capable of embracing emergent phenomena. Professor Messerli ended by asking what knowledge and what science can support this? There were then a series of 10 parallel peer learning roundtables where governments could share their experience in implementing the different SDGs on the agenda for the HLPF. For SDG6 on clean water and sanitation, they discussed making universal access to water and sanitation a reality, and sharing water by balancing competing needs in a context of a declining resource. For SDG7 on affordable and clean energy, the focus was on improving the efficiency of the energy system and on transforming energy sources. On SDG11 sustainable cities and communities, reflections were shared on financing the transition to sustainable cities and promoting resilient and sustainable cities and human settlements. For SDG12 on responsible production and consumption, the two round tables addressed successful approaches to delivering on sustainable consumption and production by 2030, and towards a circular economy including innovation for sustainable value chains. Finally, on SDG15 life on land, the discussions addressed sustainable forest management, and biodiversity at the heart of sustainable development. As with all UN meetings, there were a variety of side events on adolescents and youth, rural women, gender equality and citizen engagement, among others. In closing, the Director-General of the UN Office in Geneva noted that implementing the 2030 Agenda is off to a slow start. We need urgent action and a fundamental shift in the dominant development model in all countries. The Rio Earth Summit in 1992 established nine major groups of civil society, including the Scientific and Technological Community, to contribute to UN processes for the environment and sustainable development. The International Environment Forum was accredited by the UN as a scientific and technological organization, and we have contributed to the activities of this major group at the World Summit on Sustainable Development (Johannesburg 2002), Rio+20 in 2012, and COP21 in 2015, among others. Each major group can contribute a paper as its formal contribution to the documentation for important UN meetings, like the High Level Political Forum on sustainable development this coming July in New York. The following is the IEF contribution to the drafting of this paper. Science can do much to define the directions that the transformation should take, depending on the country situation (O'Neill et al. 2018), and to recommend the speed with which actions should be taken to avoid extreme or irreversible damage to human interests or the environment on which we depend. 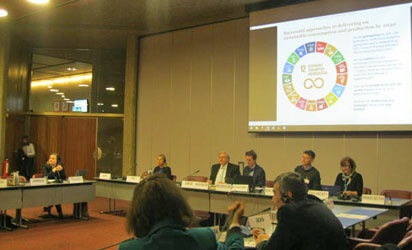 A special effort is needed to translate this global science into policy recommendations appropriate to each country. One way to support and strengthen the participation of local communities in improving water and sanitation management (SDG 6.b) will be through their widespread involvement in citizen science. Interested citizens and even school children are able to carry out water quality monitoring in local streams and waterbodies using indicator species [for example https://www.streamwatch.org.au/; http://brodheadwatershed.org/streamwatchers.html], learning at the same time about the importance of pollution control and watershed protection. Modern energy systems are all the result of advances in science and technology, and the transition away from environmentally-damaging and unsustainable energy sources also depends on innovations in science and technology. However, an engineering approach by itself will be insufficient. Energy system planning needs a major contribution from the social sciences to incorporate non-market approaches, gender equality, and social justice, among other perspectives. Meeting the targets for SDG7 will require major advances in energy transmission and storage, improved efficiency in energy use, and technologies appropriate to all users, particularly the poor and those in rural areas without access to modern energy services. The transport sector in particular faces major challenges in adapting its very conception and extensive infrastructure to non-fossil-fuel energy sources within the time frame that science says is necessary. Human settlements have been growing ever larger, but this trend is itself unsustainable. There is a need for research and technologies on more sustainable urban design, and on better linkages between urban and rural areas, as well as on the optimal sizes for communities from both social and technological perspectives, replacing the growth paradigm. Wastes enter into both SDGs 11 and 12. Many forms of waste have been created by science and technology and need new solutions. Information technology (IT) wastes have not been designed for recycling, and are accumulating rapidly with planned obsolescence. Plastics have become a new environmental menace. Many other persistent compounds from innovative chemistry are accumulating around the world with impacts on human health and the environment. Radioactive wastes need new solutions since long-term disposal is so problematic. There is potential here for public/private/science partnerships (SDG17) in redesigning technological products for recycling, in developing closed cycles for scarce materials, in reducing the half-life of radioactive wastes, and in finding replacements for plastics, following on the model of the Montreal Protocol that successfully managed the replacement of ozone-depleting substances. The success of science has produced new problems for sustainable production and consumption that require more research in the social sciences to address properly. For example, the impacts of the spread and consumption of IT products and networks need to be studied, both to improve their use to empower the poor and provide everyone with access to knowledge and science, and also to understand the dangers of overconsumption, the cultivation of addictions to social media, impacts of children's use of technology on their education and the development of young minds, and the dangers of their use to manipulate the public in everything from consumption patterns to elections. Researchers in both the social science and technology communities should collaborate on these emerging issues. The extensive research in marketing and product design to increase consumption is not presently balanced with research to reduce excessive consumption. There are behavioural barriers, mindsets, confirmation biases and ideologies that are resistant to fact-based information. Alongside research on more durable and recyclable products, a major new effort is needed on how to motivate simpler, less material lifestyles, being content with little, and turning in other directions once basic needs are met. The scientific community should explore wider partnerships across the social sciences to include those dealing with the ethical, moral and spiritual dimensions of human purpose where some of the answers may be found. The economic sciences are challenged to design alternative economies that are socially just, altruistic and cooperative, create employment, and reduce poverty and inequality, in implementation of the Sustainable Development Goals. Despite the need for social science research on topics such as the ethics of sustainable development or the sociology and psychology of behaviour change, it is still very difficult to find funding for such research. The organizing partners should identify such neglected areas of science relevant to SDG implementation and call on countries to support them. While business is a legitimate partner in implementing the SDGs, research is needed on both the danger and the potential consequences of businesses "taking over" sustainable development, becoming the dominant partners to make it a profit-making enterprise for the very few. "Greening" products is necessary, but is not the core of sustainable development. More fundamental change is often needed in directions that will not be attractive to business. It is important to encourage technologies that people and communities can master themselves, and not only those that are profitable in a business context. Looking ahead to the 2019 HLPF where inequality (SDG10) will be on the agenda, it is important to address inequality in access to and the use of science, in addition to the obvious concern about inequality in the distribution of wealth. Science and knowledge should be accessible to everyone, in ways that new information technologies are only now making possible. This requires an open source approach. The scientific and technological community needs to explore alternative models for funding scientific publications to replace the present intellectual property approach that excludes the poor and those outside academic institutions from access. Leaving no one behind should apply to science and technology as well as to all the other aspects of the SDGs. Certain cutting edge areas of research in science and technology are becoming so complex and expensive that only the largest and richest countries can still pursue them. Such science needs to become more international so that scientists from all countries can contribute and benefit. The number of multilateral environmental agreements has multiplied over several decades, creating a fragmented assemblage of hard and soft law that is often difficult to apply, particularly at the national level. A group of 80 experts from 40 countries has prepared a draft Global Pact for the Environment that assembles and codifies the main principles of international environmental law, supplemented based on current challenges. It consolidates the principles already agreed in the Stockholm Declaration of 1972, the Rio Declarations of 1992 and 2012, the environmental Sustainable Development Goals and the Paris Climate Change Agreement of 2015. They propose this as the basis for negotiating a legally-binding international treaty that would supplement the existing conventions, filling gaps and making them easier to implement. United Nations has already adopted two Global Pacts, in 1966, one dedicated to civil and political rights, the other to economic, cultural and social rights, so there are precedents for this initiative. France organized a Summit for the Global Pact on the sidelines of the UN General Assembly in September 2017 with some 40 Heads of State and Government and ministers who called for support to the project. A resolution is being prepared at the UN to establish an intergovernmental working group to negotiate a final text. Even in its draft form, the Global Pact is a useful summary of international environmental law. It has a preamble and 26 articles, each devoted to one aspect of international law and development – most of which enjoy consensus. In particular, it includes the right to an ecologically sound environment; the duty to take care of the environment, to exercise prevention and precaution; to remediate environmental damages; to enforce “polluters pay”; to establish inter-generational equity; to ensure public information and participation, access to environmental justice, education and training in environmental protection. The Pact also provides for the vital role of non-governmental stakeholders; the effectiveness of environmental standards; resilience; non-regression of standards and shared but differentiated responsibilities. It suggests mechanisms for implementation and follow-up. The text of the draft is provided below. Every person has the right to live in an ecologically sound environment adequate for their health, well-being, dignity, culture and fulfilment. Every State or international institution, every person, natural or legal, public or private, has the duty to take care of the environment. To this end, everyone contributes at their own levels to the conservation, protection and restoration of the integrity of the Earth’s ecosystem. Parties shall integrate the requirements of environmental protection into the planning and implementation of their policies and national and international activities, especially in order to promote the fight against climate change, the protection of oceans and the maintenance of biodiversity. They shall pursue sustainable development. To this end, they shall ensure the promotion of public support policies, patterns of production and consumption both sustainable and respectful of the environment. Intergenerational equity shall guide decisions that may have an impact on the environment. Present generations shall ensure that their decisions and actions do not compromise the ability of future generations to meet their own needs. The necessary measures shall be taken to prevent environmental harm. The Parties have the duty to ensure that activities under their jurisdiction or control do not cause damage to the environments of other Parties or in areas beyond the limits of their national jurisdiction. They shall take the necessary measures to ensure that an environmental impact assessment is conducted prior to any decision made to authorise or engage in a project, an activity, a plan, or a program that is likely to have a significant adverse impact on the environment. In particular, States shall keep under surveillance the effect of an above-mentioned project, activity, plan, or program which they authorise or engage in, in view of their obligation of due diligence. Where there is a risk of serious or irreversible damage, lack of scientific certainty shall not be used as a reason for postponing the adoption of effective and proportionate measures to prevent environmental degradation. The necessary measures shall be taken to ensure an adequate remediation of environmental damages. Parties shall immediately notify other States of any natural disasters or other emergencies that are likely to produce sudden harmful effects on the environment of those States. Parties shall promptly cooperate to help concerned States. Every person, without being required to state an interest, has a right of access to environmental information held by public authorities. Public authorities shall, within the framework of their national legislations, collect and make available to the public relevant environmental information. Every person has the right to participate, at an appropriate stage and while options are still open, to the preparation of decisions, measures, plans, programmes, activities, policies and normative instruments of public authorities that may have a significant effect on the environment. Parties shall ensure the right of effective and affordable access to administrative and judicial procedures, including redress and remedies, to challenge acts or omissions of public authorities or private persons which contravene environmental law, taking into consideration the provisions of the present Pact. The Parties shall ensure that environmental education, to the greatest possible extent, is taught to members of the younger generation as well as to adults, in order to inspire in everyone a responsible conduct in protecting and improving the environment. The Parties shall ensure the protection of freedom of expression and information in environmental matters. They support the dissemination by mass media of information of an educational nature on ecosystems and on the need to protect and preserve the environment. The Parties shall promote, to the best of their ability, the improvement of scientific knowledge of ecosystems and the impact of human activities. They shall cooperate through exchanges of scientific and technological knowledge and by enhancing the development, adaptation, dissemination and transfer of technologies respectful of the environment, including innovative technologies. The Parties shall take the necessary measures to encourage the implementation of this Pact by non-State actors and subnational entities, including civil society, economic actors, cities and regions taking into account their vital role in the protection of the environment. The Parties have the duty to adopt effective environmental laws, and to ensure their effective and fair implementation and enforcement. The Parties shall take necessary measures to maintain and restore the diversity and capacity of ecosystems and human communities to withstand environmental disruptions and degradation and to recover and adapt. The Parties and their sub-national entities refrain from allowing activities or adopting norms that have the effect of reducing the global level of environmental protection guaranteed by current law. In order to conserve, protect and restore the integrity of the Earth’s ecosystem and community of life, Parties shall cooperate in good faith and in a spirit of global partnership for the implementation of the provisions of the present Pact. States shall take pursuant to their obligations under international law all feasible measures to protect the environment in relation to armed conflicts. The special situation and needs of developing countries, particularly the least developed and those most environmentally vulnerable, shall be given special attention. Account shall be taken, where appropriate, of the Parties’ common but differentiated responsibilities and respective capabilities, in light of different national circumstances. Note: Vanuatu was known as the New Hebrides until it gained independence from Britain and France in 1980. It was mentioned in the Tablets of the Divine Plan, but it was not opened to the Bahá'í Faith until October 1953. Vanuatu, an archipelago of 80 volcanic islands in the South-West Pacific, is ground zero in the world’s fight against climate change. As with other island nations, climate change is the most significant single threat to sustainable development, particularly because of the large proportion of the population living in coastal communities. 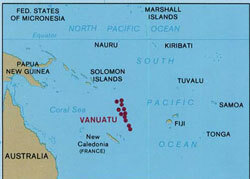 Additionally, Vanuatu’s location on the Pacific Ring of Fire means that it is highly exposed to volcanic eruptions, earthquakes, tsunamis and landslides. According to the Commonwealth Vulnerability Index, Vanuatu is the most vulnerable developing country in the world. So it is not surprising that Vanuatu was the first Pacific country to establish a Ministry of Climate Change. Nationwide efforts to include climate change and disaster risk reduction in primary and secondary education began some five years ago. In 2014, the non-government organization Vanuatu Rural Development Training Centres Association (VRDTCA) decided that a climate change course should be produced for use in some 35 rural training centers around the archipelago. Funding was made available from the German aid agency GIZ through its CCCPIR (Coping with Climate Change in the Pacific Island Region) program, and I was hired as a consultant to produce and deliver such a course. One of the most pressing problems of humanity in the current century is how a growing, rapidly developing, and not yet united global population can, in a just manner, live in harmony with the planet and its finite resources. Certain biological realities present themselves when an organism negatively affects or exceeds the capacity of its ecosystem. The limited availability and inequitable distribution of resources profoundly impact social relations within and between nations in many ways, even to the point of precipitating upheaval and war. And particular arrangements of human affairs can have devastating consequences for the environment. The question of the impact of climate change, and to what extent it is man-made and its effects can be ameliorated, is today a major aspect of this larger problem. The Revelation of Baha’u’llah directly and indirectly touches on a range of such concerns in a manner that speaks to a harmony between society and the natural world. It is essential, therefore, that Baha’is contribute to thought and action regarding such matters. – The Universal House of Justice, 29 November 2017, to a group of individual Baha’is. Taking inspiration from the Baha’i teachings, the admonition of Baha’u’llah to carry forward an ever-advancing civilization, and the Baha’i sequence of Ruhi courses, I designed the climate change course materials in a way that emphasized participatory learning and promoted reflection and learning through experience. Interactions between students, and between students and communities, were to be conducted with humility, with a focus on consultation between the parties concerned. Emphasis on fostering unity and coherence was paramount, since these attributes are key factors in strengthening community resilience to hazards and climate change. It took almost three years for this project to reach fruition. I had to produce the materials in English and then translate them into French. Two pilot courses had to be run in the outer islands to test the effectiveness of the learner guides, learner workbooks and facilitator guides. In the end, I created 56 booklets, 28 in English and 28 in French. VRDTCA was dissolved in 2015 and its functions assumed by the Ministry of Education’s TVET department. The Vanuatu Qualifications Authority had its own requirements that had to be fulfilled: this involved considerable modification to the original content, and a tortuous process towards achieving official accreditation of the course. A fresh organization had to be found to host the delivery of the program—eventually identified as the Vanuatu Institute of Technology (VIT), located in the capital city of Port Vila on Efate Island. More funding had to be negotiated through the EU-PacTVET project supported by the Pacific Community (formerly the South Pacific Commission). But in mid-February of 2017, this first-ever certificate course in climate change and disaster risk reduction (CCDRR) finally began. I moved to Port Vila to spend the next six months there, with a couple of short breaks that enabled me to return to Western Australia. At the official opening, the Director-General of Education said how proud the government was that the Vanuatu Institute of Technology was delivering the first-ever certificate course in CCDRR, and additionally, the first-ever such course in the Pacific region. 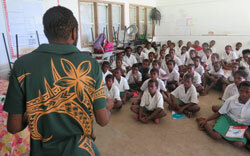 The first cohort of 31 students came from all six provinces of Vanuatu. Twenty-seven used materials in English, and four used French, but the language of delivery was the native language of Vanuatu, Bislama. Although the course had originally been designed for students in rural areas whose education had only reached Grade 10 level, those selected from over one hundred applicants included only two at this level; the rest had finished high school education or had completed up to two years of college degree courses. This huge variation in academic level posed one challenge. Another was the age range and maturity of the participants, which varied from 18 to 40. There were 21 males and 10 females. Many students had families, and in some cases they had to deliver their children to school before they themselves could come to class. Those who came in from the islands were able to board at VIT, but the majority of the cohort were day students. 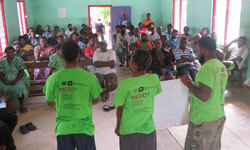 Topics covered by the course included hazard risks in Vanuatu, climate and climatic variations, causes and effects of climate change, mitigation of and adaptation to climate change, vulnerability and impacts, the importance of traditional knowledge in building community resilience, and the promotion of community action to prepare for climate change and disaster risk reduction. The basic aim was to empower the learners to become agents of change in their communities, able to conduct awareness programs and demonstrate practical techniques of mitigation and adaptation. An integral part of the course was fieldwork—surveys in the immediate vicinity of the Institute of Technology, visits to peri-urban villages around Port Vila, longer trips further afield to communities in north-west Efate and the island of Pele, and a residential field course on the island of Emao. Students learned how to present key concepts to each other, to other students at VIT and to village communities. They did research to produce hazard risk maps, discover traditional techniques of weather prediction, food preservation and fishing, and analyze the adaptive and coping capacities of communities; established their own agro-forestry plot in the grounds of VIT and practiced how to do coral planting to replace degraded reefs; conducted scientific experiments on the heating of water and the melting of sea- and land-based ice; shared learnings on traditional knowledge with a partner from another island; prepared and shared action plans for building resilience to disasters in five communities; and took a two-day course in First Aid so as to be able to handle emergencies during hazard events. Together, the students and I went on a remarkable journey to discover ways to live on an island as the sea rises around us and stronger storms batter us—to deal with an unprecedented global environmental crisis. Our greatest efforts must be directed towards detachment from the things of the world; we must strive to become more spiritual, more luminous, to follow the counsel of the Divine Teaching, to serve the cause of unity and true equality, to be merciful, to reflect the love of the Highest on all men, so that the light of the Spirit shall be apparent in all our deeds, to the end that all humanity shall be united, the stormy sea thereof calmed, and all rough waves disappear from off the surface of life’s ocean henceforth unruffled and peaceful. – Abdu’l-Baha, Paris Talks, p. 87. Baha’u’llah has announced that inasmuch as ignorance and lack of education are barriers of separation among mankind, all must receive training and instruction. Through this provision the lack of mutual understanding will be remedied and the unity of mankind furthered and advanced. Universal education is a universal law. – Abdu’l-Baha, The Promulgation of Universal Peace, p. 300. As I taught the island nation of Vanuatu’s first climate change and disaster risk reduction course (CCDRR), those central principles were implicit in the course, and sometimes, very explicit. That question led to a separate session (after class) on the Baha’i Faith. I was also able to involve several students in the activities of the local Baha’i community. Assessment of progress in each of the seven sections of the course was made under five criteria—oral communication, field research, reflection on learning, completion of workbook activities, and a short summative test. Feedback was provided on a continuous, often daily, basis. The focus was on empowering the students to take charge of their own learning, and gain the capacity to share their knowledge and skills with others. As such, it was essentially a practical, hands-on course designed to equip the students to help their own communities. Throughout the program, I was assisted by Ms. Jill Hinge, a local trainer at the Vanuatu Institute of Technology. When it is next offered at VIT during 2018, it is likely that Jill will be in charge! Three students were unable to complete the course, but 28 successfully and joyfully graduated in August of 2017 in the presence of Vanuatu’s Minister of Climate Change, the Director of Education Services and other dignitaries. It was a proud moment. After the course finished, I went with one of my students to the remote island of Mota in the Banks, and saw firsthand how he could interact with the people in his community and share many of the concepts that he had learned during the course. This was the icing on the cake! After graduation, those who had been seconded from the Departments of Forestry and Agriculture and the National Disaster Management Office returned to their former employment. Some have resumed their studies. Most, however, are either waiting for suitable employment opportunities with national or provincial governments or NGOs, or else have decided to simply return to their islands to share their knowledge and skills in their own communities. All are anxiously anticipating the creation and delivery of a higher level certificate course in resilience (climate change and disaster risk reduction) on which I am now working. The writing and delivery of this course had many challenges, but in watching the gradual empowerment and growing confidence of the learners, I would say that this whole experience has been the most exciting and fulfilling chapter in my entire teaching career. Charlie (Charles) Pierce is a long-serving teacher and curriculum writer who grew up in England but spent most of his life in Vanuatu, having gone there as a Baha'i pioneer in 1971. He is currently living with his wife Barbara in Albany, Western Australia. His areas of expertise are geography, geology and climate change. In June 2017, he was awarded the MBE by Queen Elizabeth for services to education in Vanuatu.